Erasmus WPA Eng - How to apply? Erasmus WPA Eng Main page Start How to apply? If you are selected and nominated by your home university to study at Faculty of Pedagogy and Fine Arts in Kalisz of Adam Mickiewicz University please register on-line at http://incoming.amu.edu.pl, where you need to complete our application form, learning agreement (LA) and upload your latest transcript of records. Application procedure step-by-step (download). If you have problems when choosing courses for your LA, contact the Faculty Erasmus Coordinator, Iza Krystek (zuzakry@o2.pl). 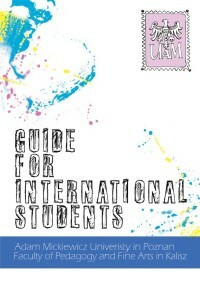 FAQs related to admission and registration information for international students. The processing of your application takes some weeks. At all times you will be able to check the status of your application online. When your application is accepted online, our university Erasmus Office will send the Confirmation Letter to your home address taken from your application form.